Observed at dusk near Kapenguria, Kenya, July 2015. 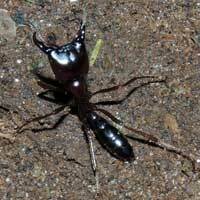 Driver ants cannot see where they are going - they lack functional eyes. The massive columns to which these fast-moving ants belong are driven mostly by sense of smell - i.e. chemicals in the air. Be it water, prey, rival colonies of ants or potential enemies, the scent will reveal. With huge numbers and powerful stings in their favor most creatures that can get out of the way, do so quickly. Indeed there are birds that follow these columns to feast on those that flee. Those that do not escape are stung to paralysis, dismembered and fed to the developing young and queen in bivouac - these nomads relocate often as the prey base is exhausted. 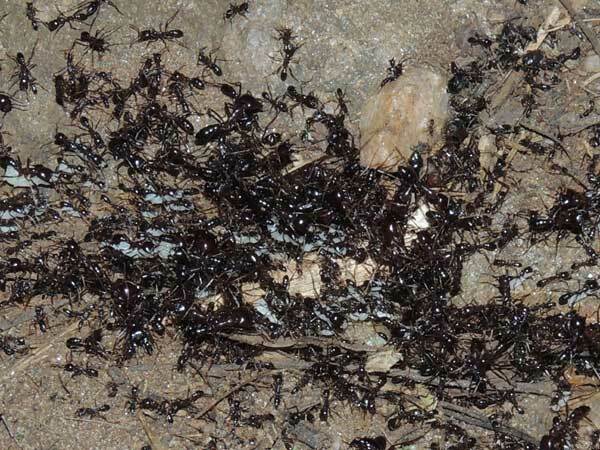 A related group of ant species in the New World tropics are called army ants. Within the genus Dorylus there are quite a number of separate species. Specific identification typically requires collection and a good microscope. The colony shown here was not seen engaged in predation. It appeared that it was relocating in its entirity. Follow the link below to read about an active predatory raid.